We had a peaceful night at the Hotel Royal and when we woke up we were ready to explore the old part of the city of Fes. 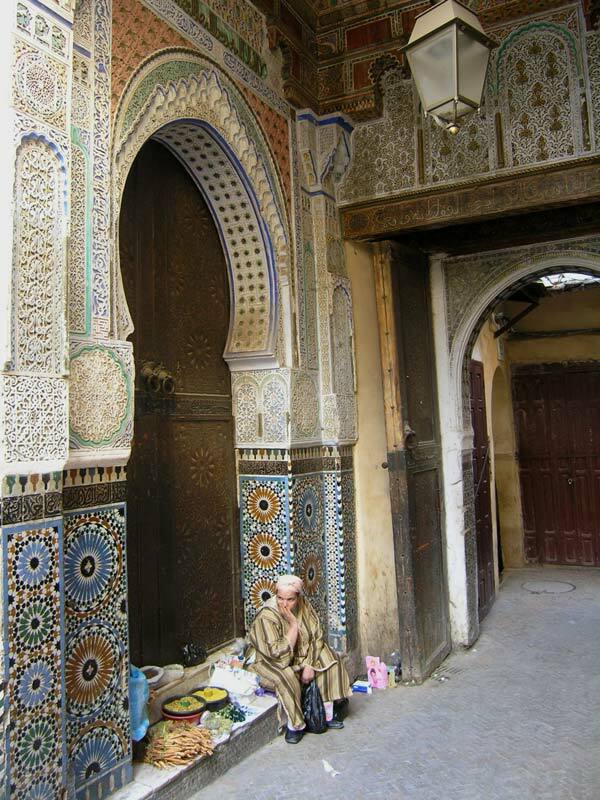 Fes is one of the four imperial cities and has been the capital of Morocco several times in the past. It is believed that Fes was the largest city in the world from 1170 to 1180 and today has a population of around one million. Fes el Bali, the largest of the two medinas of Fes, is not only the largest Medina in Morocco, but it is also believed to be the largest contiguous car-free urban area in the world. Since we even felt lost for a short moment in the tiny Medina of Chefchaouen we were pretty sure we will succeed in doing the same in Fes. 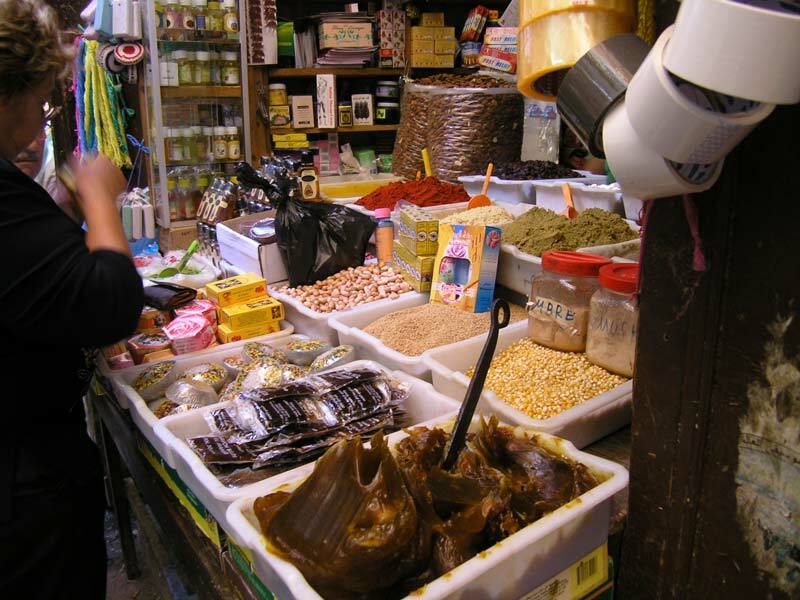 After a quick breakfast (it was finally the end of Ramadan and food was a bit easier to find) we were set for the Medina. Every now and then we had to give way to a donkey carrying some kind of a heavy load. I couldn't really decide if there were more donkeys or donkey droppings to worry about. We walked by various shops crammed mostly with junk. 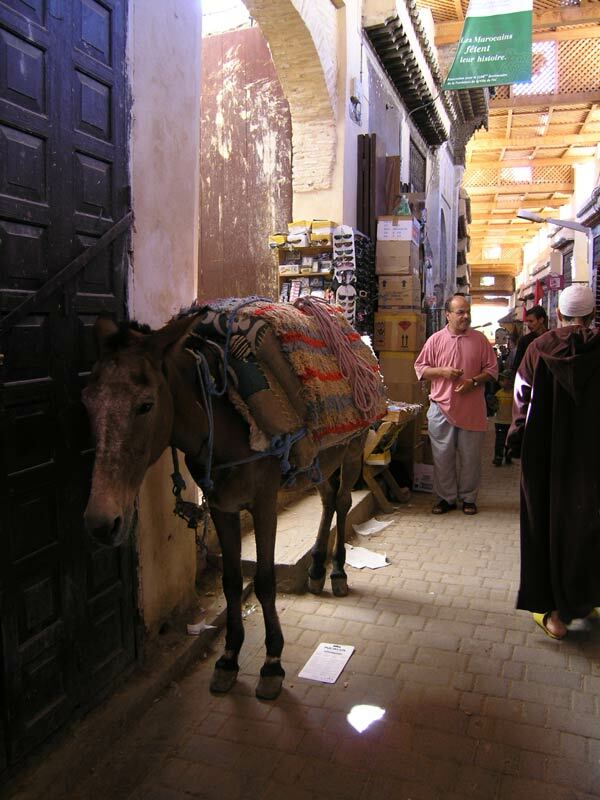 One can find lots of leather shops in Fes. 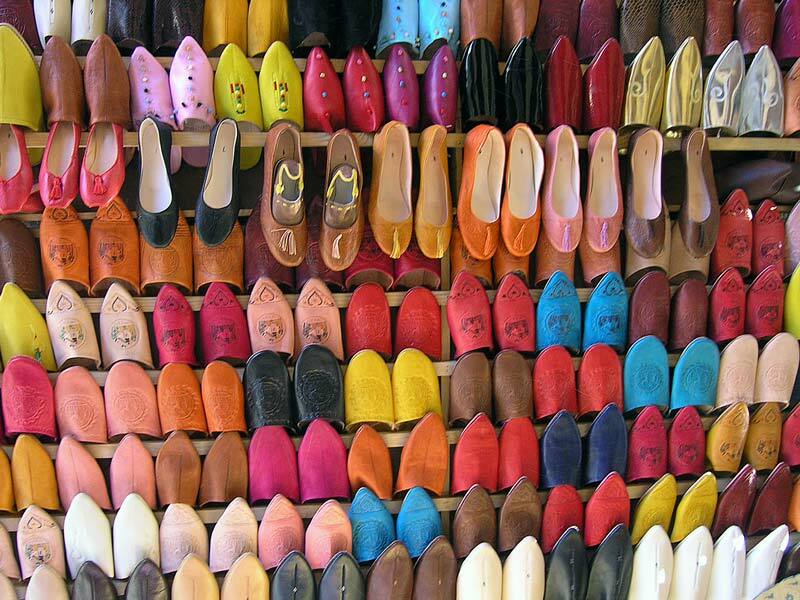 There are loads of bags, jackets (not really latest Italian fashion), belts and babouches (traditional Moroccan slippers). Owner of such a shop will usually take you to some kind of a terrace overviewing tanneries. Since we didn't plan on buying a leather jacket or some other leather product, we didn't give in to never ending invitations for entering shops. However we did buy a tea pot. A typical trashy-shiny-Moroccan-type. This is pretty untypical for us but M. insisted on having one of those. Before the deal was made we had to negotiate for at least 15 minutes. During this time we kind of insulted the shop owner for at least three times. We also left the shop two times just to be called back in with a more affordable offer. It was all a game. We ended up with a quite nice teapot of reasonable quality (at least when compared to others) for a price of 90 MAD. The negotiation started at 200 for a lower quality and half the size of teapot we got in the end. Before the negotiation game started, we agreed not to pay more then 100 MAD, so we were quite pleased with the outcome. The shop owner on the other hand didn't seem too happy but we were sure this was also just a part of the game. Later in the afternoon we bought some nuts, a bunch of postcards with stamps and visited a suspiciously dark little room with Internet access (they had a surprisingly fast connection). It was quite late when we finally decided to head back to our hotel and find something to eat. We really didn't have a hard time finding our way out of the Medina (we found one of the exits on the south-western part) and before we knew we were standing on a city bus headed in the direction of our hotel. Once again we were the only tourists on a crowded bus. We didn't mind it but some locals were obviously quite amused with our presence. At he end of the day we were quite pleased with ourselves. We survived the largest maze Morocco has to offer and didn't have to ask for directions once. That doesn't mean we knew where we were at all times, but we surely didn't feel lost. The second photo is fantastic!! I love the lighting. The motive is also quite unusual. 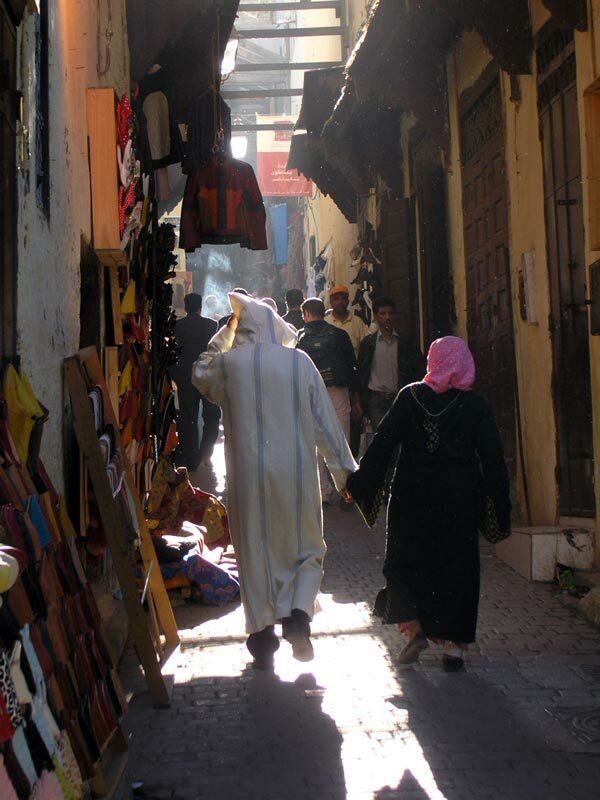 I think this was the only time in Morocco, that I saw a couple (in traditional clothes) holding hands. Something like this is definitely not a common sight in Islamic countries. Nice collection of photos you got here Marko. It looks to me Morocco is a beautiful country. Thank you for sharing. I like the patterns on the wall on the first picture, very beautiful.